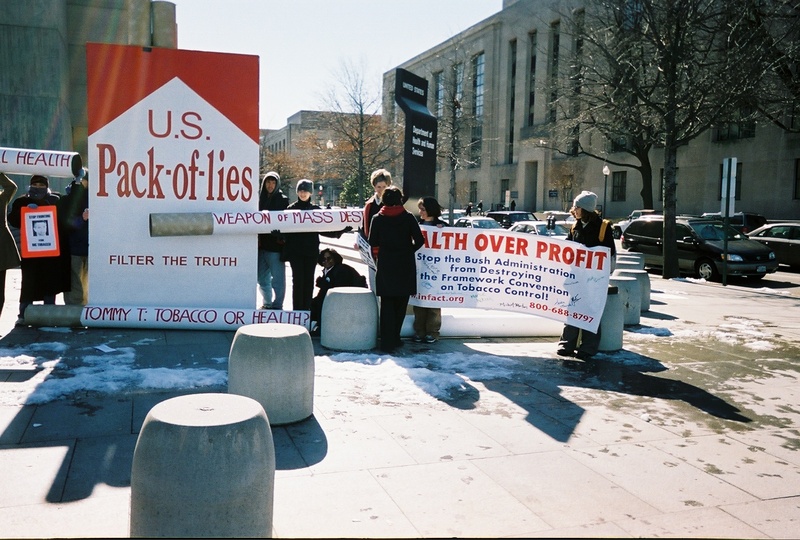 Yesterday, Infact and Essential Action held a demonstration outside of the U.S. Department of Health and Human Services (DHHS) in Washington, DC to draw attention to U.S. efforts to sabotage negotiations of the Framework Convention on Tobacco Control (FCTC). The 6th and last round of FCTC negotiations begin next Monday (Feb 17) in Geneva. Essential Action brought out its 10+ foot high "U.S. 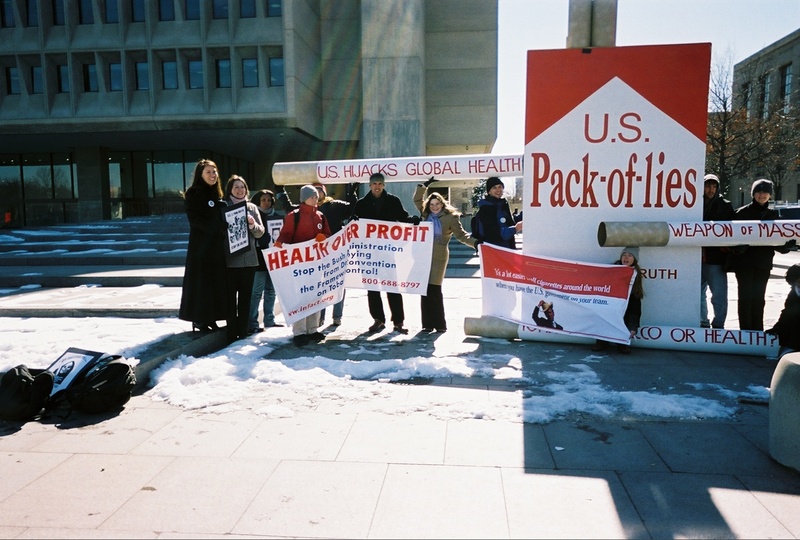 Pack of Lies" prop, complete with four gigantic cigarettes labelled "Weapon of Mass Destruction", "U.S. Hijacks Global Health", "U.S.: Stop Fronting for Big Tobacco" and "Tommy T: Tobacco or Health?" For links to photos and more information, see below! About 25 people attended the rally itself -- a great turnout for DC, particularly given the out-of-the-way location and bitter cold and windy weather conditions. We set up our large "U.S. Pack of Lies" prop in view of both the U.S. Capitol and U.S. Department of Human Services building and sign. Several reporters came, including someone from National Public Radio, who taped the entire rally. 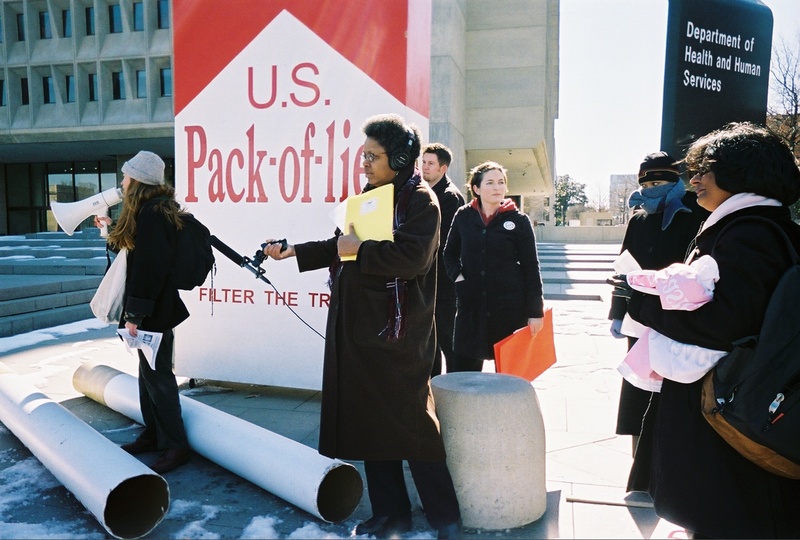 Infact organizer, Diana Silbergeld, started by relating a telephone conversation she had had that morning with Kenneth Bernard, Assistant Surgeon General and chair of the U.S. delegation to the FCTC. Mr. Bernard expressed deep frustration over the hundreds of phone calls, emails, and letters he has been receiving (great job everyone!). Needless to say, Mr. Bernard turned down Diana's invitation to come to our rally! GPTC Coordinator Anna White then spoke about tobacco's incredible global toll, a toll that the World Health Organization projects will rise to over 10 million deaths annually by 2030 -- the equivalent of 95 jet planes full of passengers crashing each and every day of the year. She emphasized the irony of the Bush Administration's failure to properly address these "weapons of mass destruction." 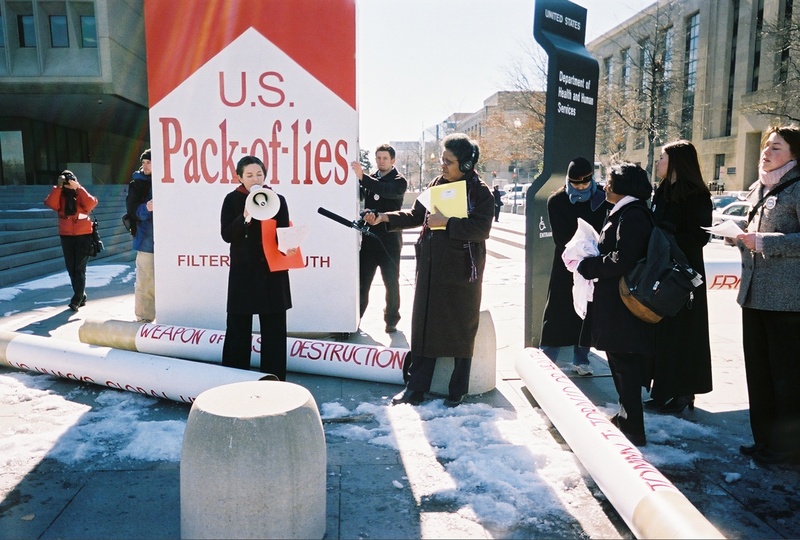 Next, a statement from American Lung Association was read by Geetha Veliah, Program Manager of Tobacco Control. Followed by statement by Moka Pantages of the Charles County Maryland Youth Movement Against Tobacco Use. Moka is a new GPTC participant! "If the US hinders the FCTC, it will be responsible for tobaccos global death toll"
"The message to US Delegation is clear : They MUST not allow their own tobacco companies to advertise tobacco so ruthlessly and shamelessly and unethically, in developing countries. The practices which tobacco companies cannot indulge in their own country, should not be allowed to happen across their borders." "Money is not as important as people lives"
"U.S. should know it influences the whole world. We use American examples here in our advocacy. Please do something positive. Forget selfishness, so that you can be the world leader in truth -- indeed, the world is watching and waiting"
Letter from Rep. Henry Waxman (CA) and Senator Richard Durbin (IL) to President Bush, decrying the U.S. government's efforts support Big Tobacco's global expansion. The letter addresses: 1) Trade negotiations that benefit tobacco companies. 2) Market assistance to tobacco companies. 3) Framework Convention on Tobacco Control. 4) Smuggling. New Infact Report "Cowboy Diplomacy: How the U.S. Undermines International Environmental, Human Rights, Disarmament and Health Agreements"
The World Health Organization has spent three years crafting a global tobacco treaty. As negotiations come down to the wire, U.S. delegates appointed by President Bush's tobacco-friendly White House are gutting it.